Glasgow Warriors fans should "make the most" of Stuart Hogg because he "won't be in Scottish rugby much longer", says former Scotland prop Peter Wright. 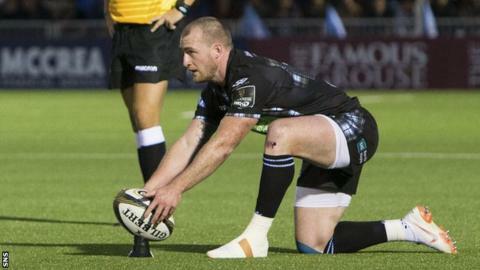 Hogg, a two-time British and Irish Lion, has spent his entire professional career at Glasgow, but his contract expires at the end of the season. And Wright says the Scotland full-back, 26, would be "stupid" not to make a lucrative move to England or France. "Who wouldn't want Stuart Hogg playing for them?" Wright told BBC Scotland. "He's a great player in attack, he's got real pace, he can step off both feet, he's got a huge boot, he can pass - he can pretty much do anything you want him to do." Hogg contributed 12 points to Warriors' 25-10 triumph over Munster on Friday, having scored the winning drop-goal in their opening Pro14 victory at Connacht. His former Glasgow and Scotland team-mate Finn Russell left Scotstoun for Parisians Racing 92 this summer, where he is reportedly earning £800,000 per season. But Wright believes the Hawick native would be even more coveted and says he would be "stupid not to go for that big contract". However, former Glasgow half-back Colin Gregor believes Hogg's departure "is not definite". At Warriors and Edinburgh, the playing time and workload of Scotland players are monitored by the governing body, ensuring they have adequate rest to peak for international fixtures and big club matches. Hogg also part-owns a pub and is "looking at life after rugby" so may be minded to stay in Scotland, Gregor said. He added: "If he's looking at career longevity, he might think he's better managed staying in Scottish rugby. You earn a decent amount over more years than a couple of years of real big earning."